Star Wars Plush Bouquets | Nerd Much? What is the best way to tell someone who loves you back that you love them… besides the iconic “I know?” Why not say it with a plush bouquet? These two Star Wars bouquets are ThinkGeek exclusive and adorable to boot. One is perfect for Valentine’s day or anytime you want to let your Princess or Smuggler know how you feel, and retails for $49.99. The other is an adorable depiction of the forces at Endor for $59.99. The “I Love You, I Know” bouquet features an 8-piece set of plush figures. Two of which depict the iconic Princess Leia and smuggler Han Solo. The other six plush figures are hearts with classic Star Wars lines in pairs. The Han and Leia plush designs are adorable and based on their appearances in Star Wars: A New Hope. The “Endor” bouquet features Han and Leia, Chewbacca, R2-D2, C-3PO and Wicket the Ewok representing the forces of the Rebel Alliance. This Star Wars bouquet also features three Imperial forces including a Stormtrooper, a Scout Trooper, and a AT-ST. Naturally, character appearances in plush form are based on Star Wars: The Return of the Jedi. Each plush is made up of 100% polyester. They are about 4” tall and come with a removable “stem” for each plush so you can display them as you see fit. To care for them it is suggested that you spot clean them with a damp cloth, but there is no indication if that helps deal with Sarlacc acid-stains. Overall, both sets of plush are completely adorable and represent their respective characters quite well. Between the two the “I Love You, I know” set may be the better buy because of the iconic Han and Leia pairing, combined with those many famous lines between them. 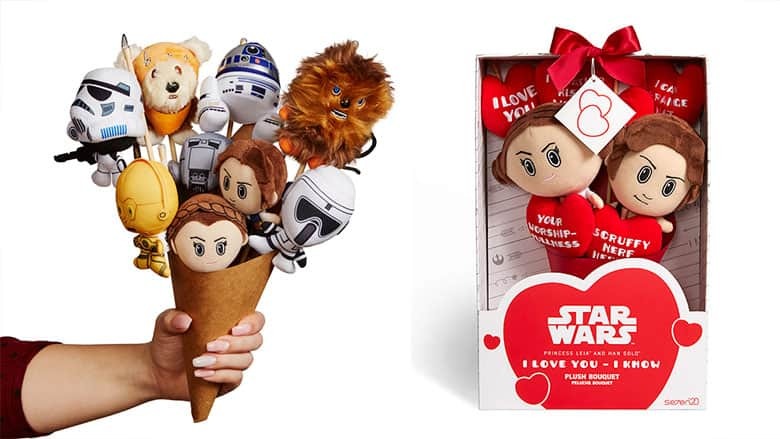 Best of all, they make a very romantic gift for your Star Wars obsessed significant other at only $49.99. The “Endor” bouquet at $79.99 is a little more general and while it makes for a great gift, may not have an obvious holiday you can connect it to. Unless you celebrate Life Day, of course. Check out more awesome nerdy Valentine’s gifts here and more cool Star Wars stuff here.